A majority of experts have been dissatisfied with the work of the public opinion committee on reactors 5 and 6 at the Shin Kori Nuclear Power Plant in Ulsan, regardless of their stances on atomic energy. The committee was launched late last month after the temporary suspension of construction of the two reactors. It has declared it will act as just an advisory body, unlike the government's initial plan to follow the final decision made by the so-called "citizen jurors" selected by the committee. Ten experts interviewed by The Korea Times generally agreed the committee has a long way to go. They are from the fields of nuclear power, environmental studies, sociology and law. They regarded the committee's insufficient attempts to discuss the matter with concerned people as the main drawback. "The committee should allow both pro-nuclear and anti-nuclear experts to agree on the ground rules, but it has yet to do so," said Eun Jae-ho, senior research fellow at the Korean Institute of Public Administration. "If it arbitrarily sets the rules, its decisions will not be accepted by those opposing the conclusion." Yum Hyung-cheol, secretary general of the Korea Federation for Environmental Movements, expressed his concerns about the committee, criticizing it for not examining whether its polls will be accepted by the people interested in this issue. Lee Kang-won, of the Korea Center for Social Conflict Resolution, demanded the committee focus more on the opinions of experts and the people concerned. "In addition to various topics for discussion, the committee should think about how it will reflect the opinions of Ulsan residents and how it will draw public attention during the discussion," he said. Some experts said the three-month period is too short to conduct the poll. "Germans have discussed the same matter for 20 years," said Prof. Lee Myoung-jin of Korea University's Institute of Social Research. "People will unlikely form a social consensus in three months. It is no different than a sudden telephone survey." The sociologist said the committee's coming survey is nonsense, just as the nation's previous public opinion polls were that decided candidates for lawmakers and presidents. Shin Ji-hyung, a lawyer at the Green Korea Legal Center, said the committee seemed to be in confusion from the beginning, because it is struggling to finish its work within three months. Chang Moon-hee, senior research adviser at the Korea Atomic Energy Research Institute, doubts ordinary citizens can pick up basic knowledge about nuclear power, claiming experts in science, the humanities and law should discuss the matter for a longer time and advise the government afterwards. The researcher also said the committee has been based on an "unlevel playing field" from the beginning. "The committee seems to take its course as the President wants," Chang said. "The pressure will make the group of people lean to one side." Professor Whang Joo-ho, from Kyung Hee University's Department of Nuclear Engineering, criticized the administration's attempts to ban government institutions from promoting nuclear energy. He emphasized the committee should be run fairly. Professor Yun Sun-jin, from Seoul National University's Graduate School of Environmental Studies, however, said the committee excluded experts on polls as it was obsessed with neutrality. "Most experts in public polls are anti-nuclear activists, so they were excluded from the committee," Yun said. 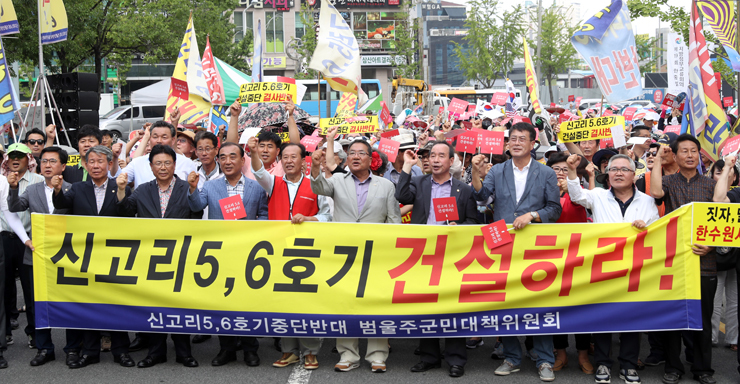 Despite the problems, most experts agree the committee has a firm legal basis, unlike the Korea Hydro & Nuclear Power (KHNP) labor union's claim. The union filed a lawsuit this week to nullify the committee's establishment. "The public opinion committee established without any legal basis has no right to determine the fate of nuclear power plants and the future of Korea's energy issue," the union said in a statement. "The future of energy should be decided through discussion at the National Assembly, the representative body of the people." Legal experts dismissed the claim, regardless of how they stand on nuclear power. "If the committee forces the government to follow its decision, its establishment should be regulated by law," Shin said. "Given that it defined itself as an advisory body, however, the committee can be set up on the prime minister's order." Shin regarded President Moon Jae-in's initial plan to follow the committee's decision as the main reason for continuous provocation for legal disputes. "Moon seemingly made the remark to emphasize his desire to follow the people's opinion," she said. Kim Tae-hoon, permanent representative of the Lawyers for Human Rights and Unification of Korea, also denied the union's claim, although he has opposed the shutdown of the reactors. However, the lawyer criticized the administration for avoiding a more efficient process. "The basic plan for electricity supply and demand is based on the assumption that nuclear reactors will be suspended," he said. Chang, on the other hand, agreed with the KHNP union. "The construction of power plants should be regulated by the Nuclear Power Safety Act," he said. "However, the government came up with the ambiguous Energy Law. A judge I know said the committee is highly likely to face legal disputes." All of the interviewees unanimously agreed that the final decision on the reactors should be made by the government, not citizen "jurors." They were generally positive about the committee's attempt to limit its role to advice. "Those who major in polls think forming a consensus is better than just asking about the pros and cons," said Kim Hak-lin, a professor at the Dankook Center for Dispute Resolution. "I praise the committee's current stance, because its advice will help the President make a decision without a heavy burden." Yun said, "Although the government and the National Assembly may make the final decision, the opinions of citizens are very important."